Starlight headliners that create the illusion of a night sky through a combination of fiber optic and LED technology are usually reserved for super luxury cars like the Rolls-Royce Phantom. However, some auto trimmers have begun fabricating them for a range of makes and models. One such trimmer is Ryan Nettleton of Exact Art Fabrications in Philadelphia, Pennsylvania, who told us all about how it’s done. The first vehicle Ryan fabricated a starlight headliner for was a customer’s 2002 Mercedes-Benz G500. Below, he describes the entire process from start to finish. The headliner was wrapped first with a four-piece stitched up cover of suede. 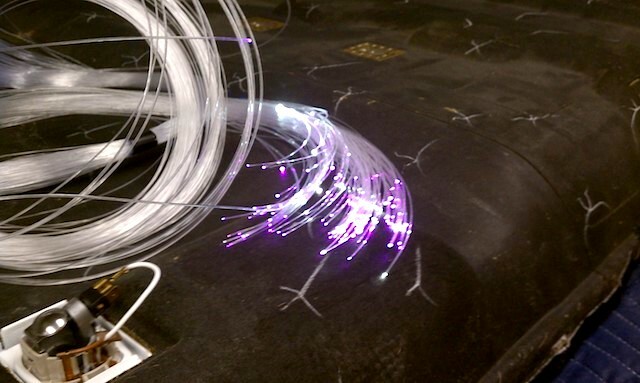 After that was complete, I started with the fiber optic strands. At the time all I could find online were kits for household ceilings, but that didn’t stop me from trying it. The kit that I purchased had a color and twinkle wheel and a small remote to turn them on and off with a total of 288 Stars (or fiber optic strands) consisting of three different sizes. The kit was purchased through Tri North Lighting and was set up for 120v, so I installed a power inverter to handle that. 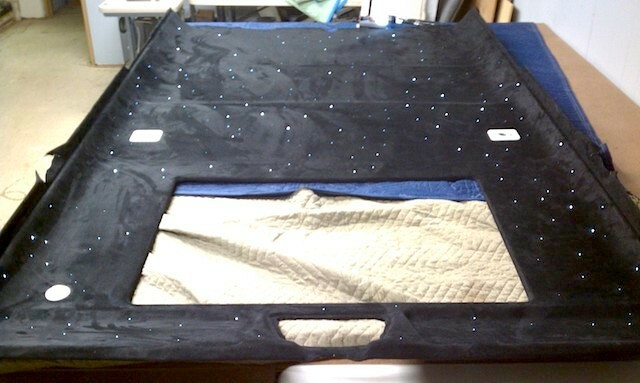 I slowly poked 288 holes in the headliner with upholstery pins and lost count quite a few times… but after the holes were poked through I started running strands. To make constellations, I drew out the ones I wanted to put in it on the back side and poked the holes. 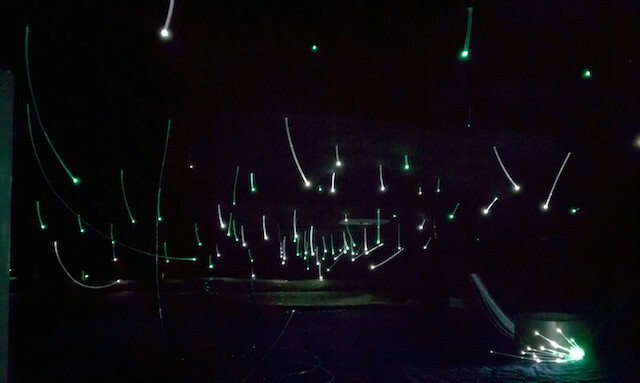 Larger strands were larger stars and placed in the proper spots to make things like the Big Dipper and the Milky Way. To keep them in place while installing, I used some duct tape along the way, and after they were all installed I used some very thin patterning material and glued it down over the entire back side to keep everything in one spot. After the back was secure and everything was held in place, I clipped the fiber optic strands that were sticking out of the face of the liner with a small pair of snips. 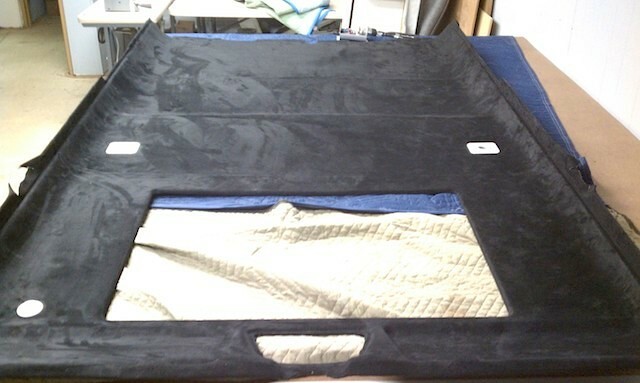 The strands, where they went to the controller, went off the back right corner of the headliner and down the rear pillar where the controller box was installed. Everything else was installed like factory and that part was complete. This was my first time doing this and all said and done took me 45 hours just on installing strands. The second time I did a roof, it took closer to 30 hours. The work didn’t stop there. After a previous shop did a shoddy job of upholstering the G500’s cabin, Ryan turned his attention to other interior elements. 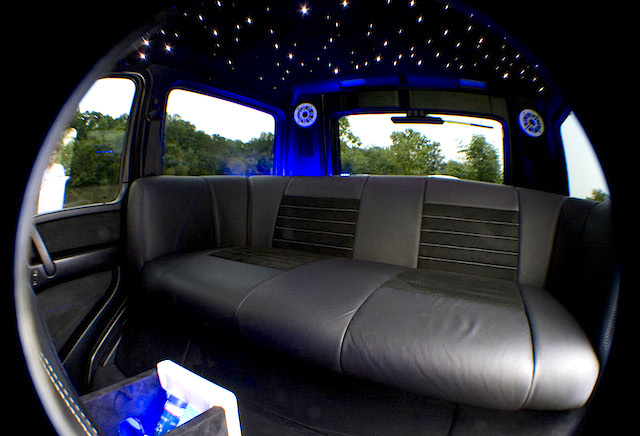 He rebuilt and upholstered the seats in black leather and suede; spruced up a boring speaker box with LED lighting and airbrushed Mercedes-Benz logos; fabricated a bar top with ice chest; and extended the front console to house an iPad, backlit liquor cabinet and more. Ryan was able to execute this project with success because of his experience in vehicle audio/video/lighting, which he’s been doing since his teens, and auto upholstery, a skill he picked up later in life. In 2008, after wiring vehicle interiors for a number of years, he turned his attention to the craft of auto upholstery. After honing his skills at local trim shops for four years, he opened Exact Art Fabrication in Maple Shade, New Jersey. The business has done so well that he recently relocated to Philadelphia, where he and his girlfriend now run a 6,300 square-foot facility. With business booming, Exact Art Fabrication is currently seeking qualified trimmers to join their team. To see more photos of their work or apply for a job, check out Exact Art Fabrication‘s Facebook, Instagram and website. Im in the process of doing the exact same thing at the moment. Nice job! Awesome! Definitely send us photos when it’s complete! Ryan bought his kit from Tri North Lighting (www.trinorthlighting.com) — I bet they can help you find the best kit for your particular project. Looks like something a pimp would have. This isn’t for the street rod type people. I’m considering this for a 97 Accord i just got. Has anyone done the lights with roof air vents?